And electric components have lots of their own requirements for setup. Since FRETS.COM is an acoustic place, I'll ignore the electronic part, and concentrate on the acoustic elements of the jazz guitar. 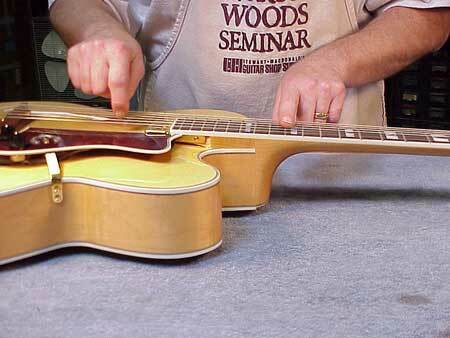 Here are a couple of topics unique to the archtop instrument design. Because the bridge is movable, and is held in position only by the downward force of string tension, it needs to be repositioned from time to time to achieve good intonation. 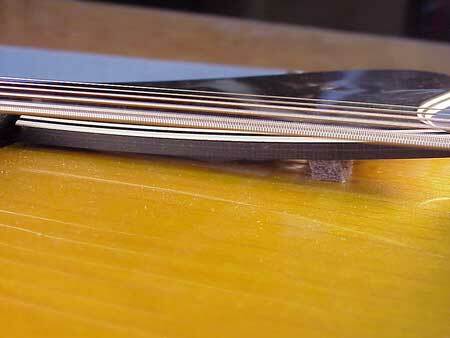 Obviously, if the fretted note is flat, the bridge needs to go the other direction, toward the neck. 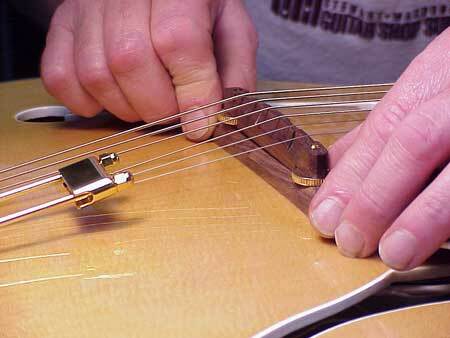 By repeating this process with the various strings, you can reach the ideal bridge position in relatively short order. 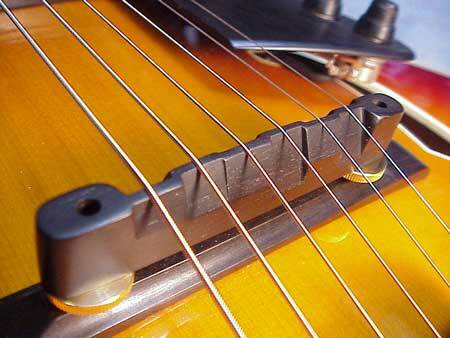 Usually, you can slide the bridge while the instrument is tuned to pitch, although sometimes it may be necessary to slack off the strings to move the bridge without damaging the top finish. Often you can get the bridge in a good position by using just the two "E" strings, leaving the others detuned completely until the bridge is where you want it. The top of this bridge is so massive that it affects the acoustic tone. 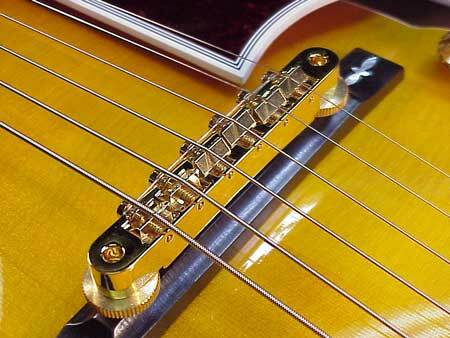 It offers nearly perfect intonation because each string can be "dialed in" to the best effect. There's something of a tradeoff here, tonality vs. intonation. 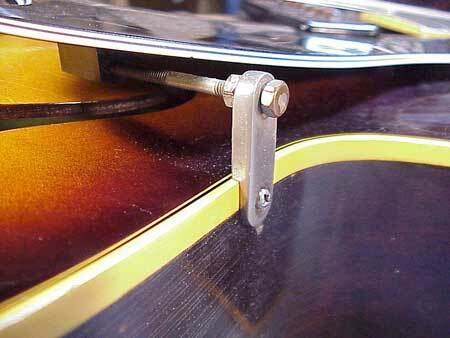 Simply screw the bridge up or down as desired. It couldn't be simpler to find the best action height. 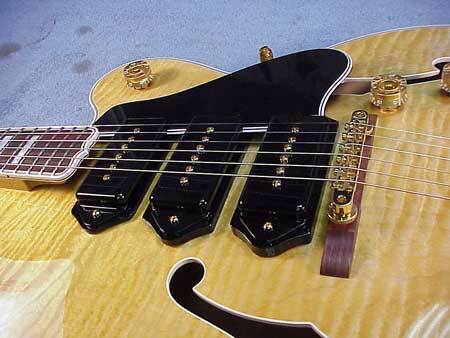 Depending on the instrument, tuning, string gauge and bridge height, it may be necessary to reduce string tension to adjust the action upward, but in virtually all cases, it's easy to lower the action while the guitar is tuned to pitch. It's a good idea to keep an eye on these things, checking them for tightness from time to time. The vibration of the instrument when played, bumping in and out of cases, and any number of small accidents can loosen various parts, causing them to rattle. Good advice. 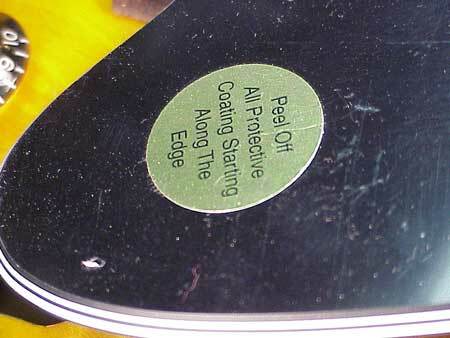 A fingerrest or pickguard is usually made of plastic, and often comes with this protective skin on the surface. If it's left on for too long, it can be mighty difficult to remove. 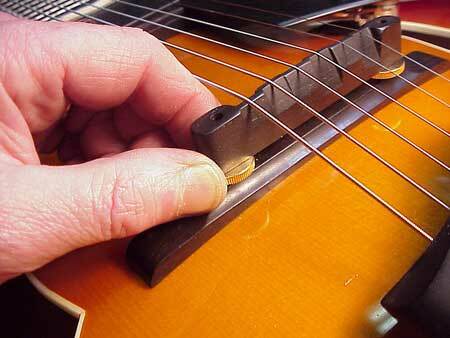 The plastic surface can always be repolished if it gets lots of pick scratches. This one has as felt block added to help keep it off the face of the guitar.